The HiRes 90KTM implant family features the most advanced sound processing circuitry in the world. The sophisticated design of all implants in the HiRes 90K family provides unsurpassed programming flexibility, nearly unlimited ways to deliver sound, and full upgradeability for access to tomorrow’s innovations without surgery. Choosing AB allows you or your child to benefit from tomorrow’s technology with today’s implant. 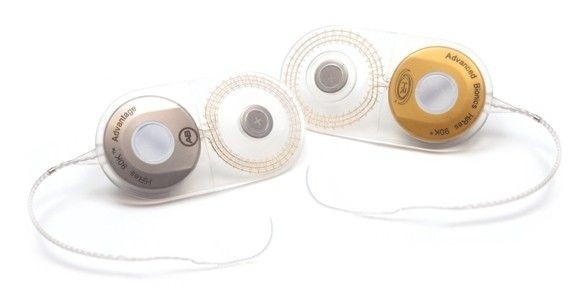 The HiFocus™ family of electrodes is available with the HiRes 90K Advantage cochlear implant. With three unique options to choose from, surgeons can choose the most appropriate type of electrode to suit individual recipient needs and provide the best possible hearing. The HiFocus™ Mid-Scala electrode has been developed to insert easily and gently for maximum protection of the cochlea. Highly effective lateral-wall placement in the cochlea. Peri-modiolar placement conforms to the cochlea's natural contour. The HiRes 90KTM implant family features the most advanced sound processing available and unsurpassed programming flexibility for the world’s best hearing performance.4,5 This sophisticated technology from AB is designed to bring you the clearest, most accurate sound possible so that you or your child can hear well in challenging listening situations like telephone conversations, office meetings, and school recitals. Mechanical improvements of the HiRes 90K™ implant that leads the industry with a 99.8% one-year cumulative survival rate (CSR),6 a measure that defines the likelihood of a device continuing to function over time. You can rest assured that an AB cochlear implant will continue to work so that you may always hear your best. Since our inception in 1993, AB has consistently made the industry’s leading technological hearing advancements, including superior temporal resolution, spectral resolution, dynamic range, and stimulation flexibility designed to be the most like normal hearing.